The traditional advice has been that cooked food and dairy products should not be composted at home as this will attract rats and smell! However in recent years a number of composters have been produced both for home, school and small business use that can produce compost from waste food, including cooked food, safely and effectively without attracting vermin or producing unpleasant odours. We have photos of the Green Cone, Green Johanna, Hotbin, Jora and Bokashi systems being used on the Compost Demonstration site page. It seems incredible but is estimated that each year in the UK about a third of all the food purchased is thrown away and that at least half of the discarded food was fit to be eaten at the time it was discarded. Over the Christmas and the New Year period alone it is said that 230,000 tonnes of festive food is wasted. The cost of this wasted food for an average UK household is calculated at about £325 per annum with costing about £20,000 in a lifetime. Much of this will be sent to landfill via the normal “black bag/bin” council doorstep collection. This is at a time where there is justified concern about climate change and greenhouse gases. While the best way to reduce landfill related methane resulting from food waste is to waste less food (and money) diverting food waste from landfill must play a key role. The amount of food waste separately collected for recycling and composting more than tripled in under a year from 36,000 tonnes in 2008/09 to over 110,000 in April-December 2009. (A study of the UK organics recycling industry - Wrap 2011). Diversion of food waste from disposal is now a higher priority for local authorities in the UK. The percentage of local authorities in the UK providing a food waste collection service to householders had increased to 47% by May 2011. In addition many were also are offering food waste collection from small businesses and schools. This shows good progress but as a composter I would argue that it is better to treat the food waste on the site where it is produced rather than collect it in a lorry and use “waste-miles” to transfer it to a central treatment site.The use of an on-site In Vessel Composter (IVC) enables waste producers, be they households or organisations, to adopt a 100% sustainable approach to the disposal of their food waste ensuring its diversion from environmentally unfriendly landfill or incineration plants. A number of local councils concerned at the amount of food waste being produced by residents and sent to landfill or incineration have introduced educational initiatives to reduce such waste at source e.g. Love Food - Hate Waste, and/or by collecting the waste separately for processing by anaerobic digestion (which still involves road transport often over considerable distances) or by providing or subsidising the purchase of, the means to treat the waste at home e.g. 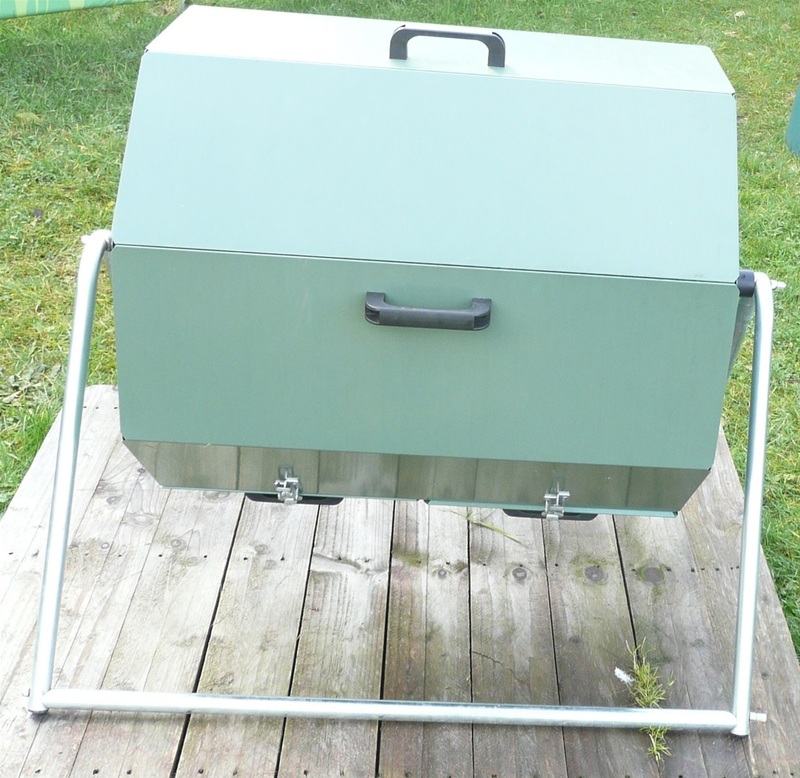 by home composters e.g. and food digesters. I believe that in addition to home the composting of food waste we should be encouraging schools, colleges, pubs, nursing homes, small and medium businesses to compost the food waste from their offices and canteens on site. In addition Councils could take a lead by composting the food and other organic waste produced in their offices on site and using the compost produced to maintain the fertility of the grounds in which the offices are situated. Our Composting Demonstration site can provide information and workshops on small scale food composting for cafes, residential homes etc. — Rising trade waste collection charges. As mentioned in the introduction the home composting of food waste has in the past presented problems for the composter as the waste tends to be dense, wet and is prone to become very smelly. If composted in a conventional heap or plastic bin it also attracts flies and rodents. However there are now a number of modern plastic bins on the market that are designed for the home composting of cooked food waste, a mixture of food and garden waste or food waste with wood chip, wood pellets or sawdust. In addition a Bokashi bin provides an indoor method of fermenting cooked food waste in a sealed container so that it can be added to a compost bin, or dug into the garden, without the problems of smell and rodents infestation associated with the traditional composting of such items. There are an increasing number of on-site composting options for businesses capable to deal with waste from organisations ranging in size from a small office to organisations with a full catering facility that produce significant quantities of food waste e.g. schools, hotels, residential and nursing homes, colleges and universities. 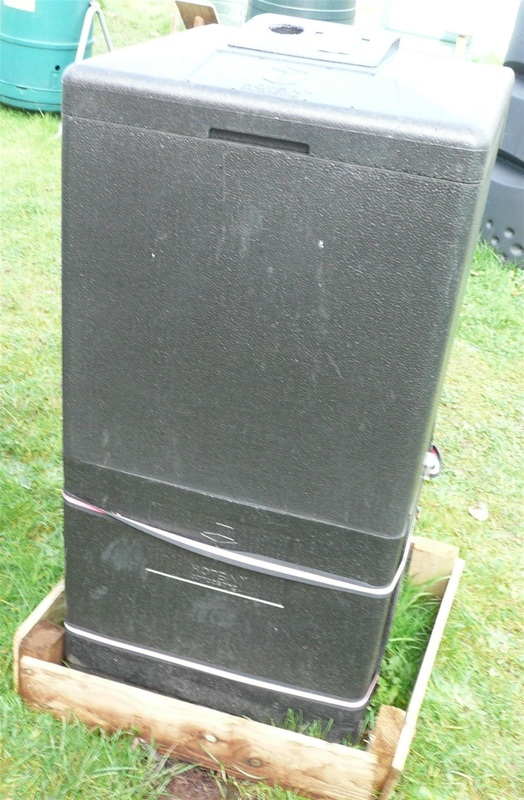 Food waste can be converted into high quality compost in around 6-8 weeks using a modern composter. The smaller composters are operated in the same way as the normal compost bin with material being added until the container is filled, the compost removed when ready. Composters of this type include the Green Johanna, Hotbin, Biolan, Jora and Scotspin. 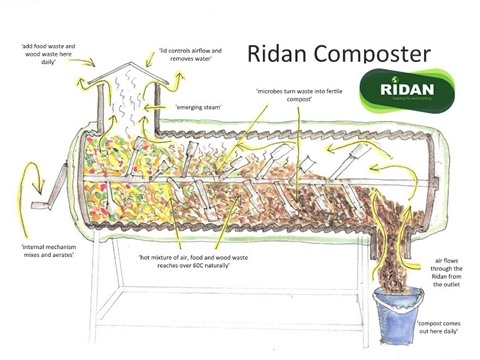 The larger more expensive food composting systems, such as the Ridan, Big Hanna, Jora 5100 and Rocket produce compost on a “Continuous Throughput System” where materials are added daily at one end of the composter and finished compost removed at the other end. On-site In-Vessel Compositing systems enable waste producers to adopt a 100% sustainable approach to the disposal of their food waste ensuring its diversion from environmentally unfriendly landfill or incineration plants. In larger organisations these systems can be used following maceration and dewatering. For medium and smaller organisations composters such as the Jora, Ridan, Hanna or Rocket provide an effective option while where a limited quantity of organic waste is produced and a as an alternative to one of the smaller models in the previously mentioned ranges one or more composters such as would be used in a larger household offer an cost effective alternative e.g. Hot bin or Jora. 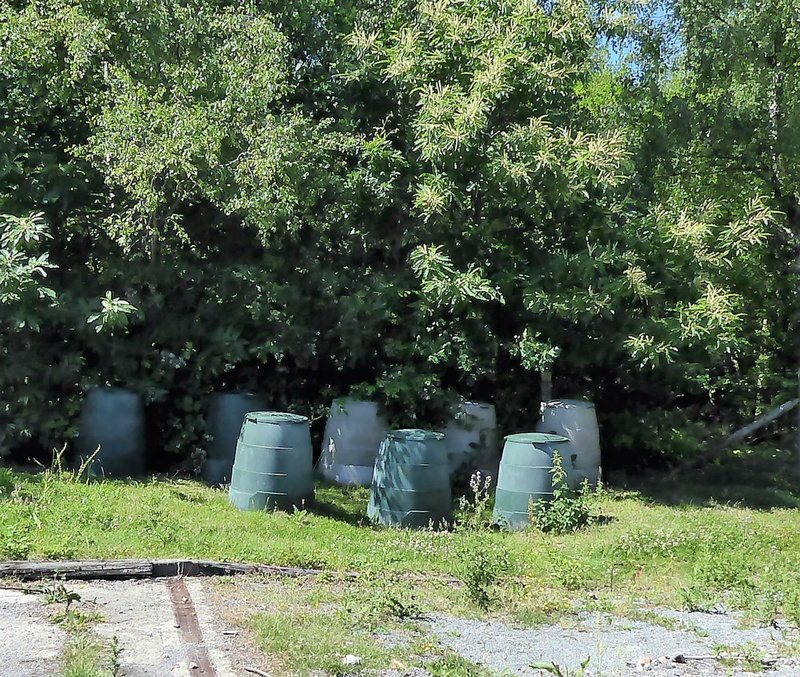 Such bins may be used in conjunction with a maturation container to store the compost while it matures so as to increase the through put of the composting vessel. Domestic composting systems normally operate best when located on grass or soil. The food waste composting systems designed for businesses, covered in the main part of this review, can be located in the open on tarmac or other hard surface and do not require any services. Larger systems may need to be kept under cover and may require an electrical supply. When considering the choice of equipment the key consideration may be the volume of waste produced but the ease of operation, harvesting, running costs and depreciation should also be considered. The key to successful composting at work or college is having one or two designated and dedicated composters on the staff or a stable club of enthusiastic students. It is important that the process is overseen and monitored regularly by the same people as variations in the mix or the operation of the equipment can have an effect on the output. Composting food waste is not a clean catering process, so it is usually best handled by staff other than the catering staff such as gardeners, grounds or premises staff or a keen volunteer from the administrative staff rather than the on-site catering staff as they are employees who need to keep very clean. If catering staff are used it is suggested that the composting role is the last activity of the day. Where catering staff are employed they do need to be actively involved in the overall project as they have a key role to play in the reduction of food waste by potion control and educating their customers. The domestic Bokashi composting system originated in Japan and offers a means of reducing food waste sent to landfill. Materials such as eggshells and bones will also be decomposed but they will take much longer to breakdown and are probably best treated using a food digester such as the Green Cone. The Bokaski is a useful system for those without a garden or who want to convert cooked food waste into a material that can be composted in a conventional compost bin. Bokashi bins can be kept in the kitchen or outside in a shed or garden. However, in colder conditions the fermentation process slows down, so it should be left to digest for a longer period (e.g. for three weeks or more instead of two). If kept outside the house an outbuilding, such as a shed, or even a garden storage box would keep it out of the rain, sun and protect the bin from frost. The purchase of this bran will cost in the region of £40 - £50+ per year whereas most of the conventional food composters will not have any running costs. 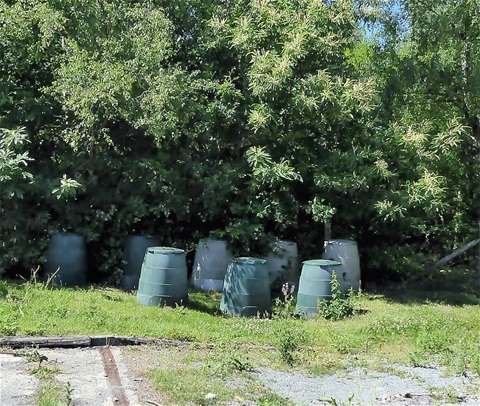 Although often described as a composting procedure the bokashi bin is frequently used as a pre-composting process with the product being added to a regular compost bin or buried in the garden. The material can be buried in a hole but I feel that it is best to use the Trench composting method where a 30cm (1ft) deep trench is dug to bury the Bokashi product (often with the addition of uncooked kitchen waste) this can be left over winter to make a bean trench. The commercially available Bokashi Bin normally consists of a plastic bin with carry handle, airtight lid and drainage tap. It has an inner drain tray to allow separation of the food scraps and liquid produced by the system and to prevent the solid material blocking the drainage tap. It will often come with a measuring scoop, a push tool and even a liquid drain cup. Some homemade systems do not include a drainage tap. The microorganisms are introduced by spreading Bokashi bran thinly on the base of the bucket and over the food during the pickling process. Some systems recommend putting two or three spoonfuls of Bokashi bran into the bottom of the bucket before adding the initial layer of food waste This is most helpful when a system is being used that does not include drainage.. The food should be added in small pieces to form a layer about 3-4cm thick. Any large pieces should be cut to 3-4 cm to enable the microorganisms to ferment the food effectively and speed up the process. If possible, use fresh food. The Bokashi system will deal with food contaminated with white mould but green or black. Scatter about a measure or tablespoon of Bokashi bran the top of the layer of waste food and compress it by pressing down with the tool provided or a potato masher to remove air pockets. Cover with cardboard, plastic to exclude air and close the bin lid. Drain off the Bokashi juice every couple of days. Repeat the layering process alternating food waste and bran as the waste becomes available, remembering to seal the bucket to exclude the air on every occasion seal until the bucket is full. Once full leave the Bokashi bin closed and undisturbed for two weeks or more, remembering to drain off the juice every other day. To work, effectively the system requires the use of two Bokashi bins. The bin in current use is normally kept in the kitchen so that plate scrapings and other food waste can be added directly to the bin. Once full, the bin is set aside for two weeks and the second bin brought into use. During the fermenting process, the bin will produce a liquid known as ‘Bokashi tea’ or “Bokashi juice” which needs to be drained off every 2-3 days. This juice contains some of the Effective Microorganisms and can be used diluted 1:100 as a soil improver but it should not be poured directly onto the plants, as it is acidic. The concentrated tea can also be used as a drain cleaner or to reduce the odour from smelly drains. This may be advantageous where the house has a septic tank, as it may help maintain a healthy septic environment within the tank. Being a fermented product the material in the Bokashi bin will smell different from compost having a sweet brewing, rather than an earthy, smell. If the contents start producing an unpleasant odour, it could be due to contamination by blue or black fungi. This contamination may occur if the lid has not been fully closed, too little bran has been used, there has been inadequate compaction of the waste in the bin or not draining off the liquid. If the bin is kept outdoors, it can also result from high temperature or direct sunlight. 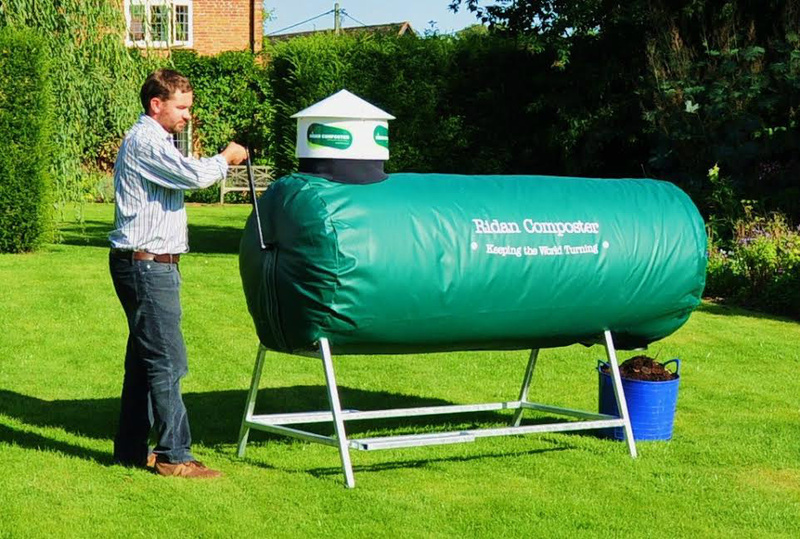 The Urban Composter sold by Original Organics is a 15L Bokashi suitable for those with smaller gardens or live in flats. It is designed to be used with a liquid spray activator, rather than the conventional dry bran. Raw and cooked food is added as for a conventional Bokashi bin but the contents are then sprayed with the activator rather than bran being added (you could choose to use bran if preferred). Boskashi liquid and solids are produced as with the more conventional bin. 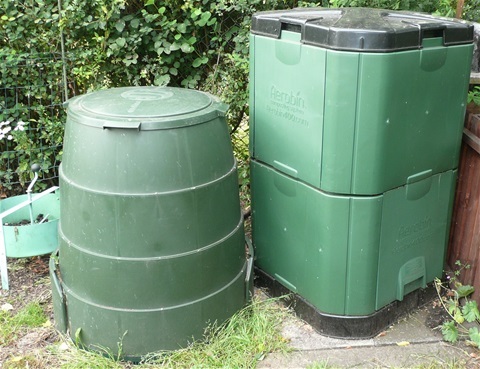 For those considering composting larger quantities of cooked food or a mixture of cooked food and kitchen and garden waste there is a large range of composters available. The choice of equipment will be depended on the amount of food waste produced and it is recommended that the first stage of any review of the food waste disposal procedures should include an audit of waste produced. This will enable the organisation to select the types of equipment that will have the capacity to deal effectively with the waste stream while avoiding the purchase to systems that cannot cope or excessive expenditure on an “all singing all dancing” system. Once the volume of waste has be calculated the merits of the different types of equipment capable of dealing with the waste should be assessed taking into account the skills and availability of suitable staff to operate the system and the collection of the waste, its movement to the composting area together with any support equipment that may be required e.g. maturation box for the storage of composted material and suitable bins in which to place the waste awaiting composting. The carbon: nitrogen (C: N) ratio one is one of the key factors in aerobic composting along with the moisture content and the availability oxygen . More information on the Compost C: N Ratio page. In the case of food waste, which is high in nitrogen, there will be an additional need for a carbon source to provide the composting microorganisms with an energy source. In addition, food waste has high moisture content and as it is broken down, water is released into the composting vessel. As a result, the structure of the composting material will not contain sufficient air spaces for aerobic composting as the food decomposes into a wet, smelly sludge. This sludge further restricts, or prevents, airflow within the material leading to anaerobic fermentation and more unpleasant smells including hydrogen sulphide (rotting eggs). This attracts rats and flies making it particularly important for the addition of bulking agent in school food composting to be carefully managed as if kitchen waste is added without bulking agent the compost will become a stinky mess within a couple of weeks. Once the waste has become saturated, the smelly liquid will drain out of the bin onto the pad or into the soil. To avoid this situation the bulking agent needs to add structure (or bulk) to the compost and create air spaces allowing air to circulate within the composting material. The correct bulking agent will also absorb the liquid from the food to maintain the correct moisture content of the food waste during composting. To absorb the liquid effectively the bulking agent should be kept dry. Bulking agent should also be used to cover the composting food waste in static bins. As the name implies the bulking agent also provides the “bulk density” when composting food waste. The bulking agent should contain, and hold, plenty of free air spaces (FAS) and will have a low bulk density. Green Mountain Technologies  suggest that the typical bulking agent should have a bulk density of less than 600 lbs per cubic yard and that wood shavings are a classic example at about 400 lbs per yard. Regular aerating the material is not a substitute for using a bulking agent containing free air spaces as the turning process only introduces sufficient oxygen to support bacterial growth for a period of a few hours. In addition to wood shavings a wide range of materials can be used as bulking agents during home composting including wood chips, saw dust, wood pellets, dry deciduous leaves, shredded garden waste, shredded paper, shredded cardboard and animal bedding. In agriculture, other readily accessible materials such as hay, wheat straw and corn stalks may be used. In some cases, animal dung may also be used. The best bulking agent to use will depend on the particular composting container, method and the nature of the food waste being used. The quantity required will also vary. Many recommend two parts bulking agent to one part food waste. The following materials are listed in descending order based on my personal preference. Wood chips can often be obtained for free from owners of land where trees have been felled, from landscape gardeners or be purchased from garden centres, It can be used fresh but composted wood chip makes a better bulking agent. Their purpose is to promote natural airflow in the pile. Some wood chip may survive composting and if the compost is sieved it can be reused. Wood pellets are effective but relatively expensive (about £2-£4 per week) for use as bulking agent when compared with free woodchip. However, they can be ordered over the net and the bags are delivered directly to the door. The pellets are normally about 4cm long and 8mm in diameter. Wood shavings should be used with care as they may form clumps when wet that can restrict airflow within the composting material. Sawdust consists of relatively small particles when compared with wood chip or shavings but due to its size is very poor in providing air circulation when wet. It is a good source of carbon but will need regular turning to allow air circulation. It is possibly best used an absorbent in emergencies or in small amounts with another bulking agent. It also makes a good initial absorbent when composting fruit pulp. Hay and straw are often available after use as animal bedding. It is a good carbon source but is likely to mat and restrict airflow when wet. Regular and frequent turning is suggested to break up any matting material. Shredded paper and cardboard may be added to conventional compost bins as a source of carbon and if crunched up to provide air spaces. However, they are not adequate as a bulking agent for home composting food. Dry leaves and garden waste can be used and are best shredded but they have been used when cut into small pieces. The production of leachate in tumbler systems, particularly when composting waste food, can complicate the composting if it seeps out of the tumbler onto the bin stand or ground attracting flies and other peats,. The optimum C/N ratio for rotary drum composting ranges from of 1:20 to 1:25 compared with the usual recommended range for conventional compost bins of about 30/1 Sufficient bulking agent such as woodchip or wood pellets being my must be added prevent leachate production with woodchip or pellets being my personal preference. Although where the fruit pulp is being composted, absorbing it with sawdust is advised as an initial stage. Details of tumbler food composters are given below. Commercial kitchens, cafes, restaurants and large schools. 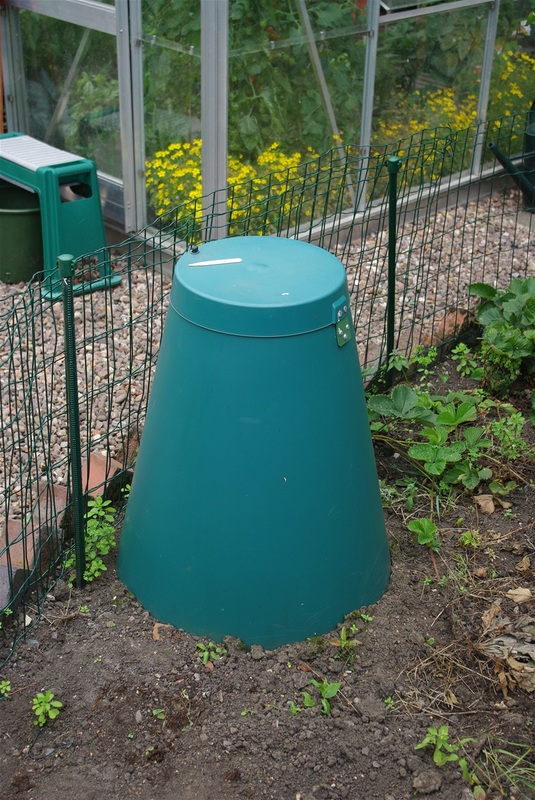 The green cone is not a composter; it is specifically designed as a domestic food digestion system for waste such as cooked vegetables, pasta, meat, bones and dairy products. It will also take a limited amount of pet faeces but is not designed to take garden or non-kitchen food waste. The double walled solar cone stands approx. 70cm high with a digestion chamber buried 42cm into the ground. It requires a sunny location so that the cone can provide a “heat trap” of circulating air to encourage bacterial growth within the food waste. and a well drained soil. As the waste broken down within the cone is reduced to water, carbon dioxide and nutrients dissolved in the water the digestion chamber must be buried in well drained soil. In clay or chalk soils the hole in which the digestion chamber is aced will have to be enlarged to at least 90cm wide and 70cm deep. Gravel and small stones can then be added to improve drainage. A limited amount of solid residue is produced by the Cone which will require removing at 2-5 yearly intervals depending on the use. An Accelerator powder, consisting of bacteria on a cereal base, is required and this will need to be added during the winter months. The cone is designed for domestic use and will take approximately ¾ to 1 kilogram of food a day which is said to be that typically produced by a family of four. In practice it should handle a small kitchen caddy every 2-3 days during the winter and every 1-2 days during the spring and summer. However this will depend on the type of food being added, and environmental conditions. The Cone is not designed to deal with bulk amounts of food related materials which would require a long time to breakdown such as the shells of crabs and mussels, cooking oils and fat. It is important that the green cone is not over filled, the waste material should be kept within the underground basket. If the residue builds up to the level of the ground the cone section will need to be removed to provide access to the basket to enable the waste to be removed. Over filling is probally the main cause of problems with the Green Cone as a master composter I have often been asked to look at Cones that "are not working" only to find that the actual cone has been filled to the brim with waste, which often includes garden waste. 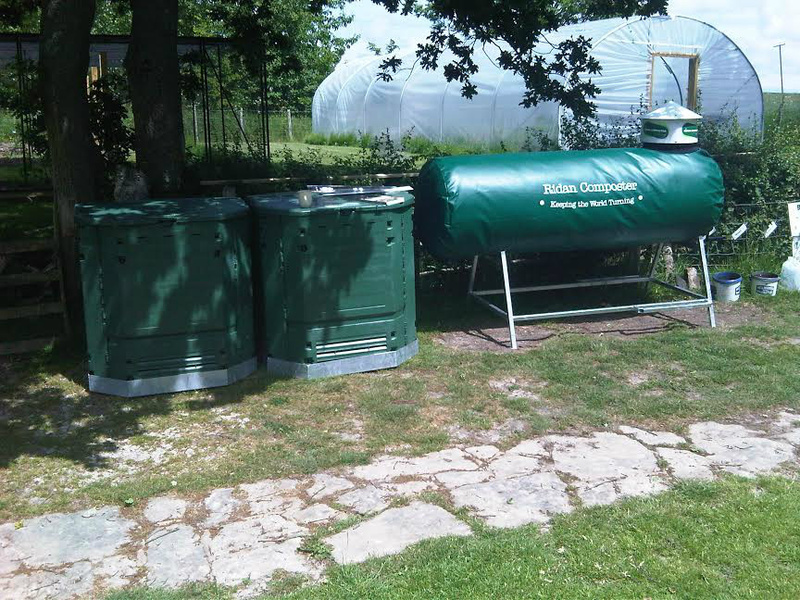 The Green Johanna is a hot composting system and food digestion which can be supplied with an insulating winter jacket. It is designed to cope with compostable waste from a family of five to eight. The Bin should be located in a sheltered shady part of the garden. The need for garden waste and careful management of the system may mean that it is not appropriate for use by some schools or businesses. However it can be operated effectively using kitchen waste with sawdust being added as a source of carbon instead of garden waste. The 200litre Hotbin is designed for the year round composting of garden and kitchen waste, including cooked food. It will take fruit and vegetable peelings, left over meals, plate scrapings, meat fish, small bones, tea bags bread and cakes in addition to garden waste such as grass cuttings, leaves and pruning’s. The Hotbin is made of insulating material (polypropylene) and if used correctly will happy operate at 40 - 60C reaching 70C on occasions. The compost bin is fitted with a thermometer which allows the temperature at the top of the bin to be constantly monitored and is supplied with an addition thermometer to allow the temperature of the compost to be measured. A ventilation flap (valve) is also fitted to allow the temperature to be moderated. Regular monitoring of the temperature provides an indication as to when fresh food needs to be added i.e. when the compost cools to less than 40C but I would recommend the routine addition of 10 litre of material weekly. As with many other food composters a bulking agent is required to help maintain airflow and to add carbon to the mix. The Hotbin uses wood chip as the bulking agent. This can either be purchased from the supplier, a garden centre or users can make their own by shredding branches from the garden. It is recommended that 1 part woodchip is used to 10 parts food waste equating to 2 handfuls of agent per 5 litre kitchen caddy of food waste. We have found that it is relatively easy to keep the Hotbin operating during the winter provided it is fed well and regularly and if the urge to continually open the bin to measure the “core” temperature can be resisted. The manufacturer recommends that approximately 5kg of waste each week. i.e two 5 litre kitchen caddies. Larger caddies can be used by I find to use prefer using 5l caddies. The majority of material I compost in the Hotbins is kitchen but garden waste can be included in this figure. My preference for food waste is based on the fact that I compost waste from a cafe and need to give priority to this waste in the systems that can deal with food waste. Click on Compost Temperature . The Hotbin lid thermometer measures the temperature of the steam rising from the composting material and unless the bin is over half full it will record a temperature 10-20°C below that of the most active part of the composting material Hotbin recommend that a long stem thermometer should be used to obtain accurate measurement of the working temperature. This is recorded when inserted in the most active layer of waste between 5-10cm from the surface layer. I mark the 10 cm with a band of tape on one of my thermometers. I also take a reading at 15cm using a second themometer and at this less active layer the temperature can be ten degrees centigrade cooler than the most active layer. 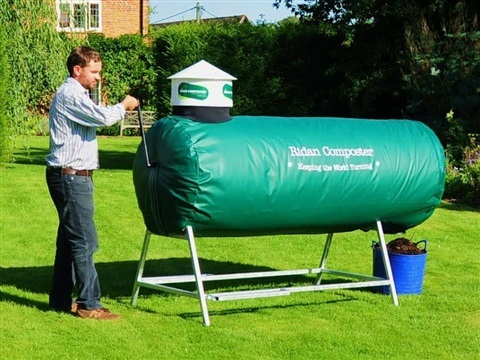 I have not tried a Biolan composter and have taken the following information from their website. The Biolan range of composters is manufactured to a high quality and this is reflected in their price. The 220litre composter will take food from 15-30 meals a day as well as garden and animal waste. It is insulated and will operate throughout the year as is said to produce compost within 6 weeks. A thermometer is fitted to allow the temperature to be monitored together with an adjustable valve for temperature and airflow. This 550 litre composter has been designed for use by schools, housing corporations, hospitals, restaurants, pubs, hotels and commercial catering companies with a higher volume of food preparation and food scrap waste. The Biolan Composter 550 is an efficient, thermally insulated composter for year-round composting of domestic organic waste. The patented ventilation system of the Composter supplies air through air pipes directly to the middle of the compost mass enhancing composting and diminishing the need to toss the compost. The adjustable air vent and the compost thermometer facilitate monitoring and attending to the compost especially in winter. You can use the bottom door of the Composter to remove mature compost and leave fresher material at the top of the bin to compost further. The Aerobin 400 is an insulated composter that comes complete with a base which holds the lechate from the composting process enabling it to be diluted and used for soil improvement. The bin includes a central aerator pipe fitted with fins to provide internal aeration. 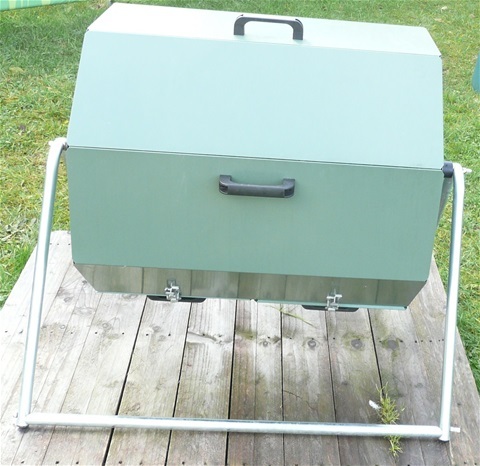 As the composter is rodent resistant one would suppose that it could be used for composting cooked food and it is included here for that reason. However while it can most organic waste including food scraps it is not recommended for oils, meat, fish, faeces from meat eaters or dairy products. The Jora range of composters will deal with all types of food waste, cooked and uncooked (including meat products). Models range from the 125 designed mainly for domestic use to large Community Composters. The models considered here are all manually operated, not requiring a power source, and are suitable for outdoor use located on hard-standing. The waste should be added to the unit frequently (every day or two) in small quantities. The composting drum on these machines is designed to rotate, mix and aerate the food waste with the sawdust or wood pellets that are added as a carbon source. The mixing also brings the fresh waste into contact with already decayed material speeding the composting process. One turn of the unit with each new quantity of waste is sufficient to aerate the contents. The model we use rotates much easier than many of the tumbling type composters that have been used in the past for garden waste. The drum is insulated to retain the heat-generated by the microbial activity. The high temperatures and even heat disruption means that immature compost will be available in 6-8 weeks. Wood pellets: 1:10 (pellets to waste). Sawdust: 1:3 sawdust to waste. Wood shavings do not absorb the moisture to the same degree as sawdust or pellets. Coir, dry leaves and dry, chopped straw can also be used. The chamber of the Jora range is divided into two compartments enabling the first compost in the first compartment to mature while the second is being filled. The first can then be emptied ideally into a maturation bin to further mature before use. Externally the Scotspin resembles the Jora range but operates using one large single chamber rather than being divided into two. It has been discontinued but I have retained it on this site as preowned secondhand models might sometimes be available. The recommended mix for best performance is one third cooked food, one third fresh peelings etc and one third dry woodchip. The woodchip can be recycled by sieving the contents into a maturation bin. This has the advantage of inoculating the fresh waste with composting microorganisms. Fresh material can be added to ¾ fill the composter which leaving enough space for the materials to tumble . As there is only one chamber in order to maintain throughput when the whole chamber needs emptying it may be necessary to remove the immature compost from the chamber before the most recently added materials have broken down transferring it to a Maturation bin such as Scotty’s HotBox to allow the compost to mature. 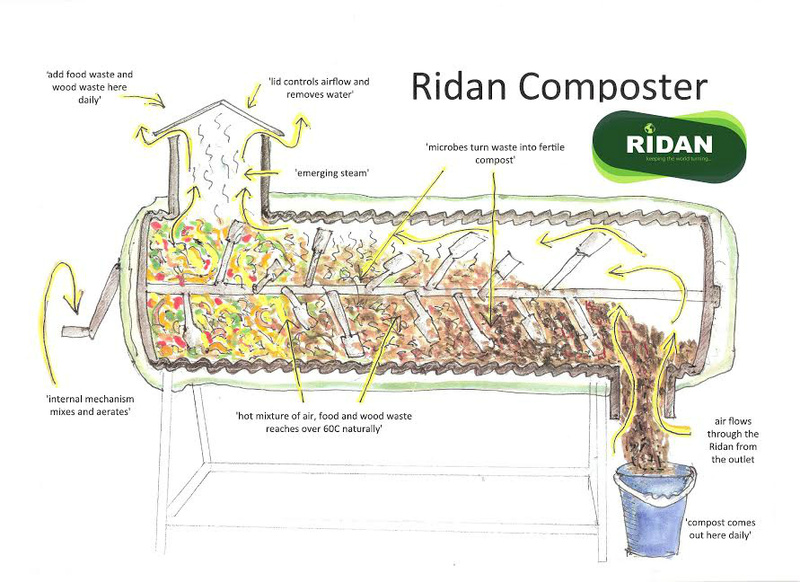 The Ridan range of in-vessel, constant throughput thermal food waste composters. It includes equipment suitable for small schools ranging up to commercial kitchens, cafes, restaurants and large colleges. Once the food waste has been through the Ridan Composter (and completed the thermophyllic stage) it is normally put in a maturation bin for a further 2 to 3 months to obtain a good growing medium before use. The Ridan should be installed on an easily washed, hard-standing capable of taking at least half a ton in weight. As they are longer than the equipment previously considered access is important to ensure that there is enough room around to turn the handle, load food waste and empty the compost. It is necessary to add a carbon source. In this case equal amounts of ‘brown’ material like woodchip to that of the half 'green' food waste. The wood chip remaining in the harvested compost can be sieved and reused. These electrically operated composters are capable of dealing with larger quantities of food waste but they will require to be housed within a building with an electrical supply (possibly 3 phase), drainage and may require supplementary equipment such as a macerator, storage space for the woodchip or wood pellets which will need to be added to the food waste as well as for the food awaiting treatment and the maturing compost. 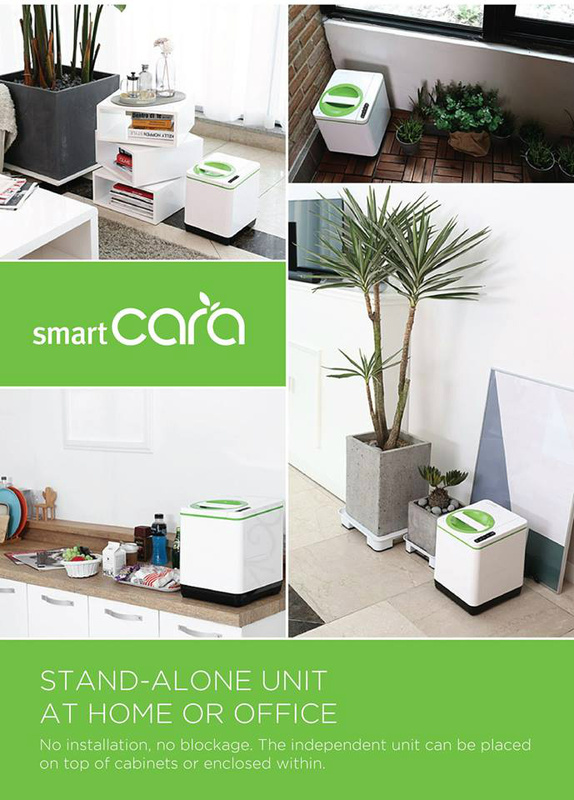 The Smart Cara marketing material offers this kitchen gadget as an alternative to council food waste collection schemes avoiding the storage of waste food awaiting collection. The Smart Cara is not a true aerobic food composting system but a clever new item of kitchen equipment that grinds, heats and dehydrates food waste reducing it in volume by up to ninety percent in three hours. It is compact and suitable for use in a home or office kitchen and can take 25l of food waste at a time. The dry odour free material produced can be dug directly to the garden, be added to a conventional home-composting bin or to the normal council bin collection. The system looks similar to some worktop bread machines and only requires access to a normal electrical socket so it can be used on a worktop, shelf or on the floor. The kitchen waste is put, or scraped from the plate, into a bucket that is then placed in the machine. The lid is closed and the machine is turned on. After three hours, the waste has been heated, dehydrated and reduced by about 90% to produce a dry material that can be used as a soil enhancer. The machine also has a wash cycle so that if required the bucket can be cleaned automatically.